An exotic, opulent Southest Asia design by Marzotto of Italy. The boteh, a droplet-shaped vegetable motif is of Persian origin. Such designs became very popular in the West following imports of post-Mughal versions of the design from India. Re-interpreted by MARZOTTO, the design remains classic yet has a modern twist with it's soft blue and terracotta hues. 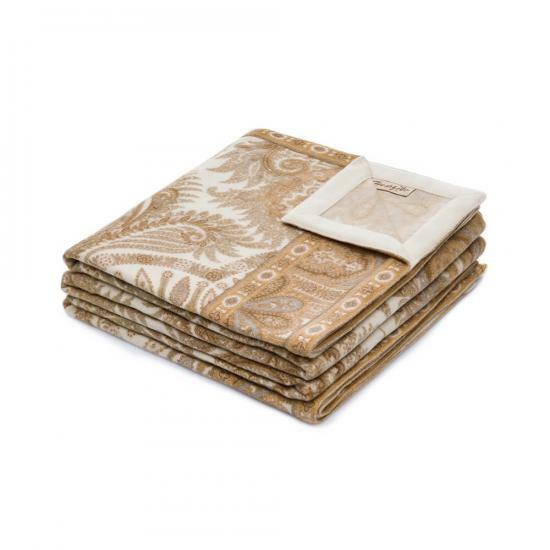 MANDALA 100% cashmere throw is available in terracotta (shown main photo), wilton blue and sand. No other discounts or promotions apply. Mandala 100% Cashmere Throw 55"x78"